Have you seen the new Vintage Vogues? I'm super excited about 8875, seen above. It's a sheath dress topped with a redingote (with a cool double collar, the second of which is removable and can be made in fabric to match the dress). Here's the original pattern; isn't it beautiful? I would love to do the Vogue version, perhaps in a blue color scheme and with some horsehair braid to give the hem of the redingote more flare, as in the original pattern. 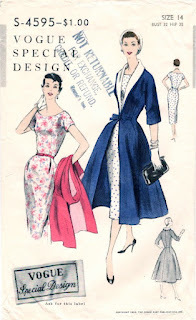 And, just for fun, a few more vintage redingtoe patterns! P.S. Vogues are currently $3.99! I'm so glad you posted the original drawings because these fabrics that Vogue picked are hideous! It totally makes me pass up the pattern, but seeing the original makes it much more appealing! Me too - I passed on this pattern when I originally reviewed the new Vogues. Thanks for pointing out the original and the history and background of the garment. Me too, I thought it looked like a bathrobe until I saw the vintage fabric choices. Love the vintage pattern at the bottom, it's squee-worthy. I just bought this pattern! I couldn't resist. I'm not sure when I'm going to make it, but I love it! Those are just wonderful! I always have a problem with buying Vintage Vogue patterns especially when they go on sale! I think I know what I should make for this spring...:D I could even borrow someone's horse for authenticity! I like the vintage pattern so much more than the reproduction one. I think the repro is a cautionary tale of what happens if vintage details such as horsehair braid aren't used. YES!! The repro looks disturbingly like a droopy robe over a housecoat. It needs structure! Of course the drawings are always much more glam than reality is (those tiny waists!. The unbuttoned overskirt showing the underskirt idea was trotted out in the 80s as well. I think it would be hard to make this attractive/modern without looking costumey. And it could be an expensive goof as it is essentially double the fabric. I love the history behind the name! At first I thought it had to be a typo or dyslexia kicking in. The only thing is I don't know how they could have ridden in these! Reading your blog reminds me of how much I miss sewing my own clothes....gonna have to do something about that? Love those vintage designs! I bought 20 patterns in the winter sale! Absolutely agree with the first comment. I think the whole concept has been lost in the reproduction. I would not have guessed that it had originated from such an awesome silhouette. I love the original, stunning. ooohh... 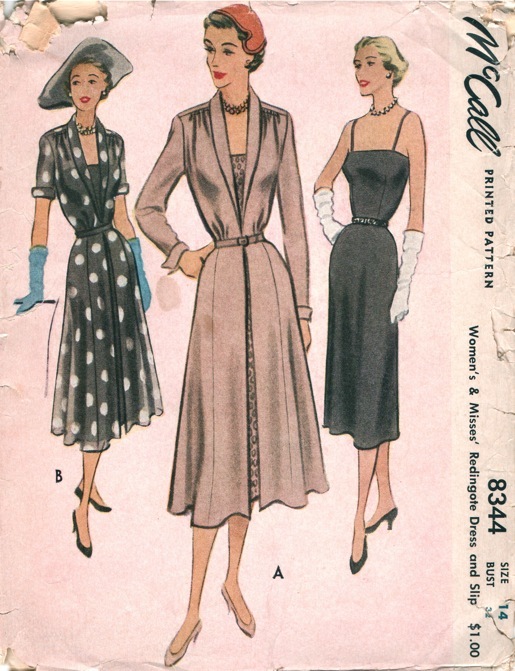 I'd like to make a shorter, jacket version of the second vintage one (butterick 5142). Without many changes (mostly the length) I think it could fit in well with a more modern waredrobe. 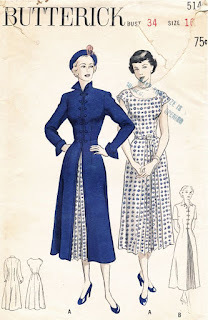 I love that Butterick pattern!! If ony I had an 8" waist like those models. Ahem. Gorgeous pattern.... all pattern companies should do more retro patterns.... they are full of history and is what sewing is all about! Oh so beautiful! All of them. I'd buy in a second if postage to the uk didn't put it right back up at normal prices! Back to browsing through my local charity shop's 99pence patterns! My favourite is the blue and white on the original pattern. So classic and clean. Stunning. Don't comment a lot, on anything, but love your blog Gertie! Your book is on my wish list as well!! My perfect dressing gown pattern!!! Vogue styling lets them down yet again, this one is wrong in all sorts of ways: fabric, fit, styling - and the posture is most unbecoming! This is an Outfit, and is really all about contrast which you can't see at all with so much pattern everywhere. On the up side I love the flared coat of Simplicty 8457, and that wide cape version at the bottom is delicious in the extreme. Reminds me of those gorgeous now vintage outfits worn by Lucille ball on the I Love Lucy show. I'm afraid I would look more like Ethel. I don't dislike it but I much, much prefer the look of the older ones. Thanks for highlighting the Vogue Pattern. 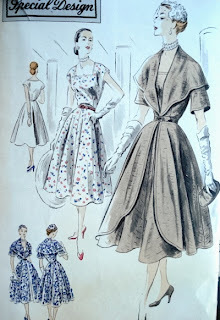 I have to agree with everyone; I much prefer the look of the true vintage pattern and what fabrics are suggested etc. I wouldn't have considered the pattern; but seeing the original changes my mind. However, of even more interest to me; and hey you are designing for Butterick now and have contacts...........Just a thought I think quite a few mentioned the lovely Butterick 5142 redingote pattern. Now that IS THE PATTERN I would love to get my hands on. The silhouette of the coat is absolutely sublime and I want it!!!! Totally off topic but did you ever draw the winners of your book giveaway from last year? 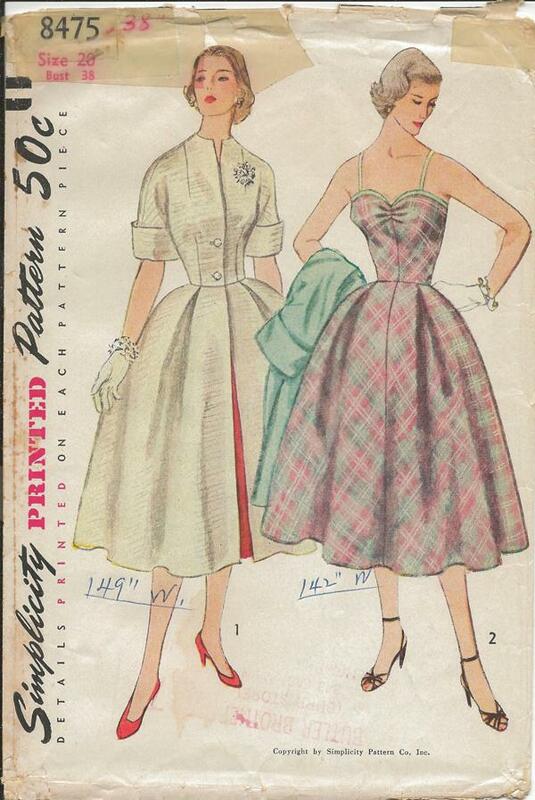 I think the wonderful 50s redingote styles you show here would be more easily achieved with another pattern--maybe Butterick 5556, which is soooo close to the right proportions and would be alot easier to alter for fit (did you see the back of this V8875?). 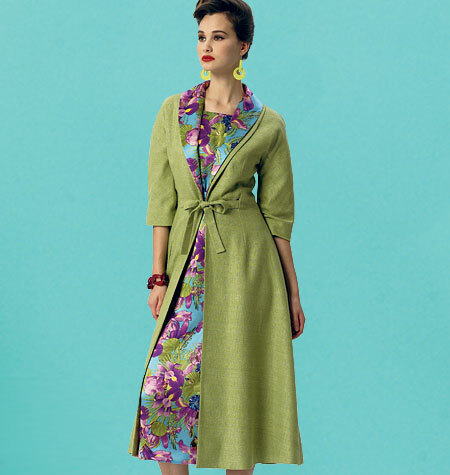 Your own Butterick coat pattern could be manipulated to create a gorgeous redingote as well. I don't think the current Vogue team "gets it" when it comes to vintage styles. So much inspiration from these patterns!!! I can't wait to get sewing!!! How lovely! I've never heard of that before and the name's history itself is interesting! lovely, and yes I agree the skirt of the coat should have a fuller shape. The dress length looks too long on the modern day version too. Always think the modern interpretations of patterns miss the vintage aesthetic mark! 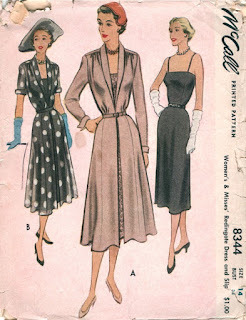 I'm with Gertie in that I fell in love with this vintage vogue pattern as soon as I saw it. It was the dress fabric that made me have a closer look - I think the Irises make the dress look vintage, and you would be admired where ever you went draped in it. Hideous? Fabulous? It does walk that line. I would love to see what you do with it, Gertie. I have just finished rereading your fabulous (definitely) book and have two quick questions for you. First, how do you finish seam allowances on your everyday vintage inspired clothes in medium weight fabric like a good quality cotton? Hand sewn finishes seem like overkill. Do you serge? Pink? I like French seams where possible,will I be adding too much bulk? 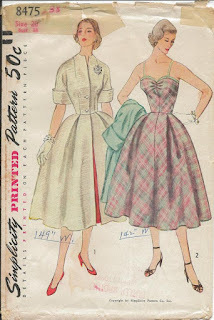 Second, so my 50s vintage patterns bust measurement is really based on high bust measurement, not across the full boobage? Or am I misunderstanding? Thank you so much. Your book has answered many, many questions for me, and continues to educate and inspire me. I love that pattern. Thank you so much for explaining what a Redingote is. I NEVER heard it before. Can't wait to see what you make from it. have you notice the dress and the redingtoe are precisely the same skirt length!!!... very challenging!! Wonderful blog! All womens dresses are awesome!! Different and unique colors. Thanks for sharing old fashion blog. I believe that Ms. Obama's yellow/green day dress for the 2008 Inauguration had a coat/dress with a similar style. It didn't have the big collar, which she probably would have appreciated given the extremely cold day. Although I don't think the open coat was probably as warm as the coat she wore in 2013, I liked the 2008 outfit much better. I think it's a more flowing feminine look. just for the fun of it (and because I had no idea that the word "redingote" existed in English), this word is an example of two-way linguistic travel: it comes from the English "riding-coat", which came to France and was transformed into "redingote" (pronounce sort of r-o-d-a-g-o-t, first o as in load and second as in lot, a sort of as in lack). And it came back to English as redingote! lovely patterns and great blog! Thanks Gertie!